I got this Karen Stone pattern from my sister Patty about a year ago. 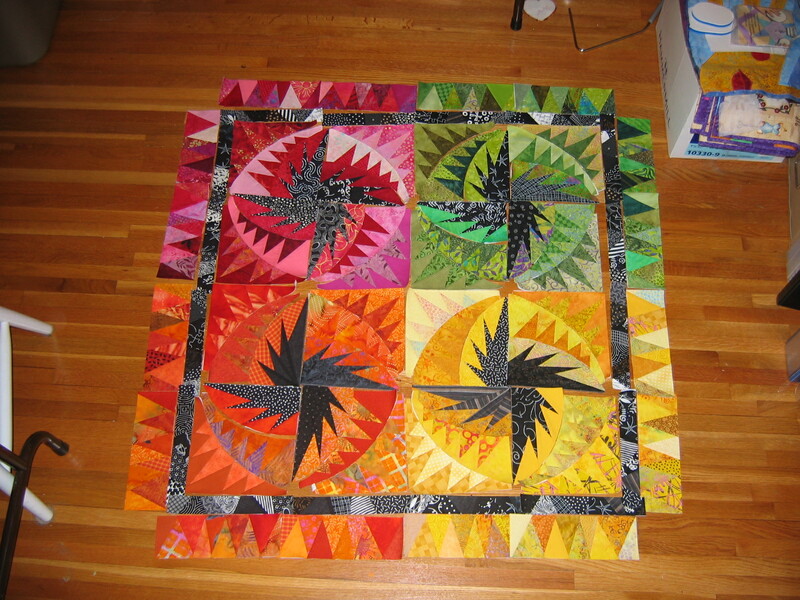 She pieced one section (red & black) when I found it among her stash. I fell in love with it and decided I had to finish it. I didn’t realize how difficult it would be. Ideally, I wanted to use only batiks… Little did I know how challenging it would be. Oranges are hard to find and yellows are almost impossible. So I’ve mixed in other fabrics that I think work well with batiks. Now, I need to finish the corners, join all the pieces, quilt it and name it by March. Any suggestions for a name would be appreciated. Hi Karen – I love the Karen Stone piece you’re working on. Very vibrant, happy and exciting. I too am working on a NY Beauty as a wedding gift. Yes, it is difficult and time consuming, but well worthy it. BTW – I just found your blog through the stats for my website and will be a loyal reader. It is such a small world. I read Tonya’s blog all the time. I’m so jealous….she lives in Paris…my favorite city. And she has such beautiful cats. My blog/site is still a work in progress but i’m having a lot of fun. Hi Karen I was responding to a comment that Tonya in Paris left on my blog and clicked on her links and there you popped up. What a small world! I am really enjoying writing a blog and have met some great people.